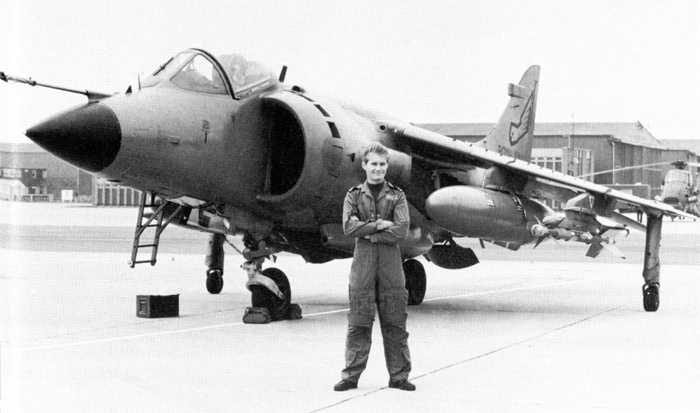 In the early summer months of 1983, Sub-Lieutenant Ian “Soapy” Watson had just launched off the ski-ramp of the HMS Illustrious in his gray BAe Sea Harrier on a training mission, flying along with a more-experienced Fleet Air Arm pilot who would be monitoring and assisting him as was needed. The mission, part of a larger NATO exercise, required that they find an “OPFOR”  French Clemenceau-class carrier somewhere near the coast of Portugal while flying in combat-like conditions. For this hop, Watson and his flight leader would thus fly with their radars off and their radios silent. This would theoretically decrease the chances of the French carrier and her escorts from being able to triangulate the positions of the incoming jump jets. Watson and his flight leader banked away from each other and climbed to different altitudes, firing up their radars and entering the planned search patterns. Upon figuring out and confirming the location of OPFOR vessel and having achieved the main objective of his mission, Soapy pointed his nose towards a pre-determined “meetup” spot where he would link up with flight lead, loitering in the area, and then head home to the Illustrious together. Pushing the stick forward slightly, he descended and zipped towards flight lead. As Soapy was about to find out, even the most thoroughly-planned missions could go awry in the blink of an eye. Upon reaching the meetup spot, the other Sea Harrier was strangely absent. Mindful of his fuel stores, which were steadily dropping, the 25-year-old naval aviator decided to return to the Illustrious by himself, using the inertial navigation system (INS) built into the jump jet. Without any sign of the carrier, he began to get worried. Something was amiss and if he didn’t rectify the solution as soon as possible, he was more than likely in for a swim in the cold waters below him. Soapy’s training kicked in and he tried all of his available options. With his radar now operating, he didn’t observe any blips show up on the small screen. Trying the radios, he came to the horrific realization that they weren’t functioning. Squawking an emergency using his transponder didn’t help either. The INS had malfunctioned and he was without the ability to transmit radio messages, flying around in a fuel-thirsty jet with less than half the takeoff fuel quantity remaining. A terrific way for a junior aviator to conclude his first-ever NATO exercise. Noting that he was near shipping lanes that constantly had a few cargo/container ships steaming through, Soapy turned eastward. The plan was to find a ship, perform a low flyby to get the crew’s attention, then eject and hope they understood to pick him up rather than wave ridiculously from the railings. In a few minutes, his radar screen brought up a contact about fifty miles away from his aircraft. Unknown to him, it was the Spanish container ship Alraigo, headed to Tenerife with important scientific cargo aboard its exposed main deck. With less than a handful of minutes of flight time remaining, Soapy flew alongside the freighter, surely gaining the attention of the crew with the loud roar of his aircraft passing near the ship’s bridge. A brief visual inspection and quick thinking gave Soapy a new idea that would (hopefully) keep him dry and his jet recoverable. 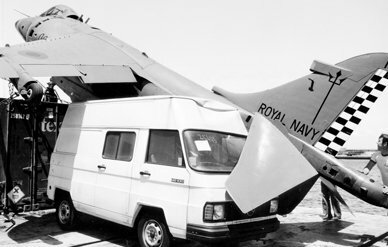 The rectangular cargo containers atop the Alraigo formed a small surface on which Soapy thought he could land his Sea Harrier, making use of its ability to land vertically, much like a helicopter. Manipulating the thrust vectoring nozzles on both sides of the Harrier’s fuselage, he slowed his aircraft down and brought it to a hover. Swiveling in the air above the Conex boxes and now directly in front of the bridge, he positioned his nose facing the bow of the small ship, and pulled back on the throttle until the centerline and wing landing gear kissed the corrugated surfaces of the containers, all in view of the terrified and confused crew of the Alraigo, congregated on the bridge and the main superstructure of the ship. That, however, wasn’t the end of Soapy’s slippery situation. His Harrier began to slide backwards with him still in it. What he hadn’t taken into account was the fact that the containers were wet, thanks to the sea-transit of the ship, and that the ship was still in motion, though its engines were rolled back to assist with the inevitable landing. Soapy tried to pull up the landing gear to stop the slide, but the Harrier kept moving backwards, landing partially angled on the roof of a florist’s van tied down to the main deck of the Alraigo. 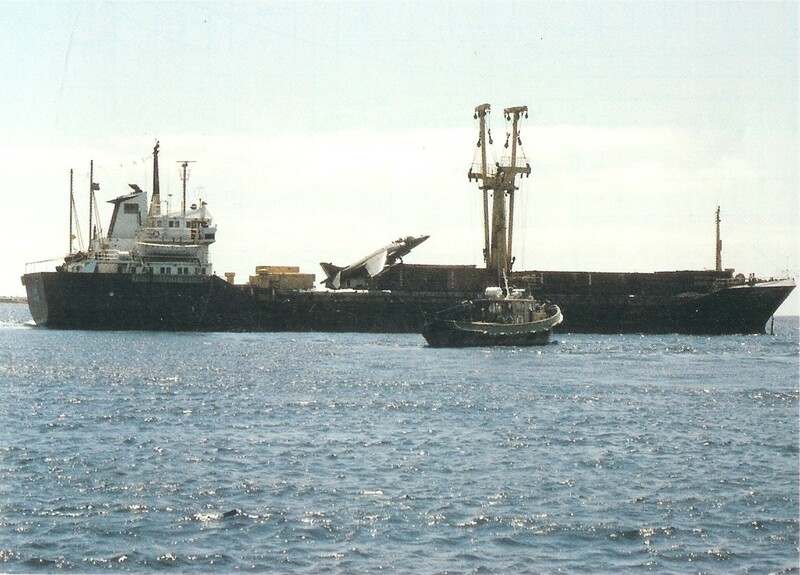 The ship’s captain made contact with the appropriate authorities while Soapy was extracted from the cockpit of the settled Sea Harrier and brought inside, but refused to dock his vessel anywhere but Tenerife, where he was due in four days. There was just about a gallon of fuel left in the Sea Harrier’s tanks. The Alraigo was met at Santa Cruz de Tenerife by scores of reporters and journalists with their cameras at the ready. The crew and owners of the vessel were given over $1.14 million USD as a sort-of rescue/damages compensation by the British government, and Soapy was placed under investigation for the whole ordeal which included nearly causing an international incident. The Sea Harrier was soon offloaded by crane and then placed on a British vessel, the MV British Tay, for its return to the United Kingdom. It was summarily fixed up and returned to duty, this time aboard the HMS Hermes. As for our hero pilot, a board of inquiry found that his superiors were at fault for allowing him to be deployed even though he had actually completely only 75% of his required training flight hours, and, for saddling him with a faulty jet with a history of avionics malfunctions. Watson was temporarily benched and was relegated to flying a desk for a period of time. He eventually returned to flight status, accruing close to 3000 hours of flying time before he resigned his commission in the Royal Navy in 1996.